Maybe it's the 70's-esq herringbone, or the unexpected back print, but this sweater makes me feel like I should be skiing every time I wear it. This is particularly strange considering both that I don't wear actual sweaters to ski, and that the fair isle sweater is by far the most popular choice at Two Elk (the best lunch spot at Vail). Regardless, I love it. Theory sweater (also awesome), Céline sunglasses, Anthropologie coat (similar Calvin Klein), Rag & Bone coated denim and Newbury boot. Such a cute sweater, love it! I followed you, cool blog ^_^ mind follow back? 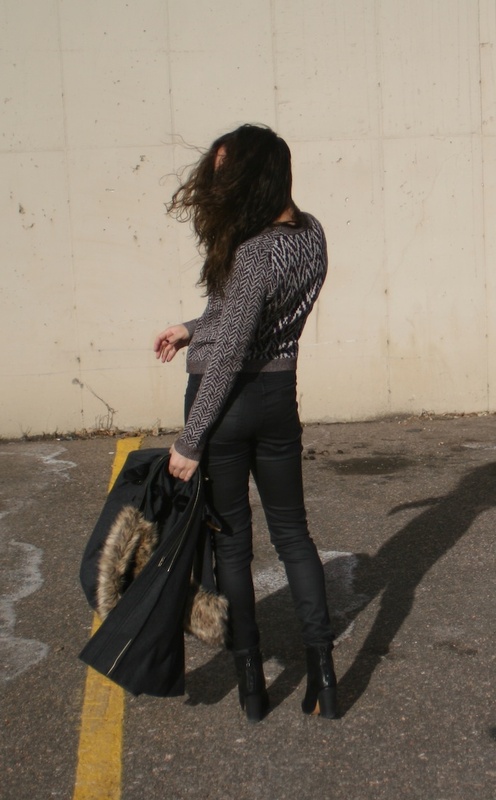 I adore your Theory sweater - and really how you styled the whole look! I like the boots so much! This is such a cute, sleek look! This outfit is pretty cool! Love your shoooooeeeeessssss!!!!!!!! and the furry details of your coat! So, so cute! I love how you styled this whole outfit. I love this Herringbone sweater (and those Rag & Bone booties, too!). Also, your love for skiing always makes me want to try it again. I skied a few times in middle school but haven't been since! Maybe in 2013.. I hope you try it again soon! I skied at Afton Alps all the time when I was in Minnesota, and Vail just bought it! so prettyful you make anything look great! I love this look, the sweater is amazing! I love such outfits - simple but chic! The shoes are great! entirely different topic but it has pretty much the same page layout and design. Wonderful choice of colors!